You’ve probably heard about the butterfly effect - the theory that even the tiniest event can set in motion a chain reaction with major consequences. The classic example is a butterfly flapping its wings on one side of the world eventually leading to a tornado developing somewhere on the other side. If a regular sized butterfly can do all of that, just imagine what a human-sized one could pull off. With one flap of the wings, that big butterfly could forever change the world as we know it, for better or for worse. That’s a lot of responsibility to lay on an abnormally large insect. Fortunately, you don’t have to worry about whipping up trouble, weather-related or otherwise, while wearing these pretty wings. These are just for show, and what a show it is. Crafted in the shape of a swallowtail butterfly, these purple, blue and black wings slip over your shoulders with elastic arm bands and feature elegant touches like blue rhinestones and a pair of attached antennae. 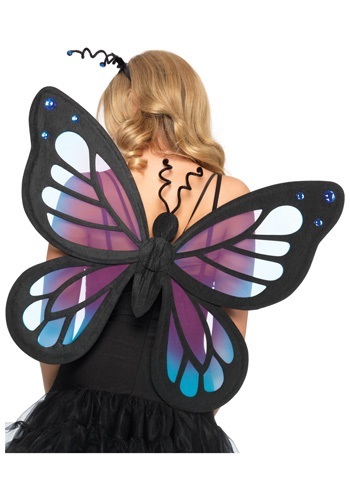 These butterfly wings are certainly lovely enough to cause a stir at your next costume party, but we’d like to hope their long-range effect won’t go too much farther than that.